In 2012, admitted to the Ministry of Justice & Islamic Affairs- Bahrain as Practiced Lawyer. Banking and Financial Services, Islamic Finance, Investment Management, Project Finance, Aviation, Capital Markets, Corporate and Securities, Employment and Labor Law, Insolvency, Bankruptcy and Restructuring, Insurance and Reinsurance, Litigation, Arbitration and Dispute Resolution, Mergers and Acquisitions. Noora has a remarkable experience in providing legal services within the banking sector and representing our banking and financial clients before the Bahraini Courts. She has a solid knowledge of banking regulations and CBB Law and providing advice to conventional banks, Islamic banks, offshore banks and other financial institutions. 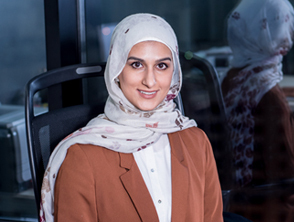 Noora has been working on a range of transactions involving capital markets, mergers, acquisitions, Project Finance, Facility Agreements and also has experience in liquidation procedures, drafting legal agreements, advising on contracts, civil aviation law, commercial companies’ law and labor law. Beside the banking experience she is also specializes in areas of corporate law, aviation, due diligence for existing companies, and corporate acquisitions. She is highly experienced in a broad range of commercial and corporate matters. Hassan Radhi & Associates is proud to be part in the APM Terminals IPO, considered as one of Bahrain's most successful IPOs. As the transaction local counsel, Hassan Radhi & Associates assisted in the Legal Due Diligence, followed by the transaction documentation and the conversion process from a Closed Shareholding Company to a listed Public Shareholding Company. APM Terminals IPO was oversubscribed with a total value of BD11.880 Million. It was officially listed on Bahrain Bourse on 9 December 2018. Solidarity acquired AAIC and converted AAIC from its current conventional nature to a Takaful company offering full range of sharia compliant insurance products. Subsequent to such conversion, Solidarity merged its subsidiary Solidarity General Takaful B.S.C. (c) with AAIC. Such a merger is took place through the transfer of business, assets and liabilities as an ongoing concern from Solidarity General Takaful B.S.C. (c) to AAIC against issuance of ordinary shares in AAIC to the shareholders of Solidarity General Takaful B.S.C. (c) at a determined swap ratio. This deal involved application of Central Banks rules and regulation to a company which is not a Central Bank licensee. This deal had three distinct features (1) acquisition; (2) conversion; and (3) merger, which to the best of our knowledge never happened in the Insurance sector in Bahrain.